All eight testing kits together. Includes 1 each of the Mandelin, Mecke, Marquis, Simons, Froehde, Liebermann, Folin and Ehrlich’s Reagents (8 kits / 10 bottles total). Each bottle contains enough reagent for 50 to 75 tests. Also includes five fentanyl test strips. Shipped discretely in a small box with “D.S.” as the return address. Overnight delivery available if order received before 12pm PST Mon-Fri (3pm EST). All eight testing kits in one convenient and cheaper package! Includes 1 each of the Mandelin, Mecke, Marquis, Simon’s, Froehde, Liebermann, Folin and Ehrlich’s Reagents (8 kits / 10 bottles total). Each bottle contains enough reagent for 50 to 75 tests. Also includes five fentanyl test strips. Mandelin Reagent (blue bottle): Good for detecting ketamine and the deadly adulterants PMA and PMMA. Also tests for the presence of MDxx, meth/amphetamine, certain substances from the 2C group, and some opiates. A solution of sulfuric acid and ammonium vanadate. NOTE: Mandelin Reagent is naturally bright yellow in color by itself. This kit needs to be shaken well before using. All color reactions given here are what you should see after 30 seconds to 1 minute. Mecke Reagent (red bottle): Good for detecting 2c-T-x compounds and certain opiates. Also produces clearly different color reactions for DXM and MDMA. NOTE: The color reactions for MDMA, MDA, an MDE are the same with Mecke reagent. You can then use the Folin Reagent to determine between MDA and MDMA or MDE. 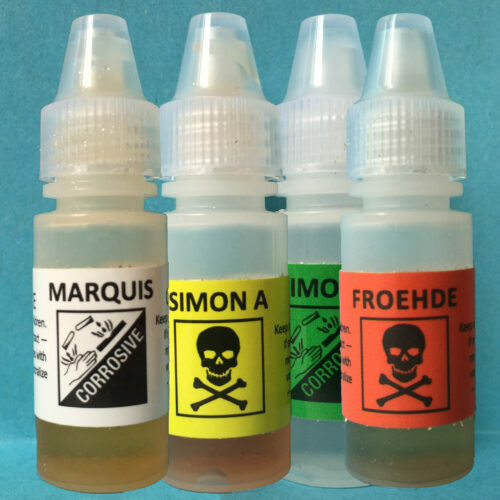 Marquis Reagent (white bottle): Marquis was our very first kit. It is an excellent field test for a wide variety of substances. NOTE: The color reactions for MDMA, MDA, and MDE are the same purple to black. Methamphetamine and amphetamine are the same orange. MDPV, methylone and butylone are the same yellow. You can then use the Folin Reagent to tell the difference between MDA and MDMA or MDE. 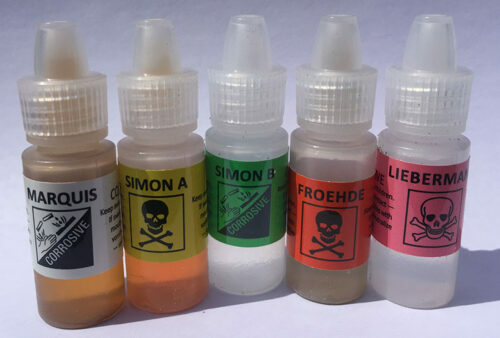 Simon’s Reagent (yellow and green bottles): Simon’s Reagent is a secondary test that tells the difference between MDMA and MDA. It can also differentiate amphetamine from methamphetamine. Contains two bottles. 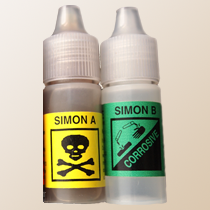 Simon’s reagent should never be used alone. It is only useful after first testing your sample with Marquis, Mecke or Mandelin. If a substance tests positive for an MDx substance by turning black with Marquis, Mecke or Mandelin, then a blue color change with Simon’s indicates the presence of MDMA or MDE (MDE is extremely rare) and no reaction indicates MDA. Froehde Reagent (orange bottle): Froehde is an advanced kit and when used in conjunction with our other kits can help identify various new psychoactive substances. NOTE: Froehde’s most important use is in identifying 5-APB and 6-APB, which are often misrepresented as MDMA and are difficult to identify with other reagents. Froehde also turns light green in the presence of PMA and PMMA, the most deadly drugs misrepresented as MDMA. It may also be useful in identifying other new psychoactive substances. 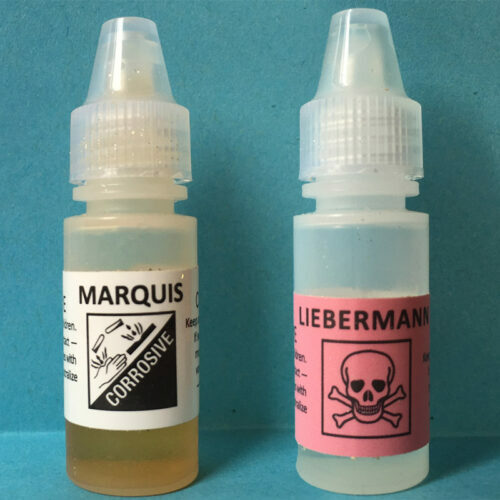 Liebermann Reagent (pink bottle): Liebermann is an advanced kit and when used in conjunction with our other kits can help identify various cathinones (“bath salts”) and other new psychoactive substances. NOTE: Liebermann should not be used as a stand-alone kit. Folin Reagent (turquoise and green bottles): Folin Reagent is an advanced kit primarily useful for detecting pierazines such as BZP and TFMPP. Contains two bottles. Folin can also distinguish MDMA from MDA, but the color changes are difficult to assess without samples of both right next to each other. It’s better to use Simon’s reagent instead. Ehrlich’s Reagent (purple bottle): Ehrlich’s reagent can be used to positively identify LSD, helping rule out 25i-NBOMe, an extremely dangerous drug that is often misrepresented as LSD. NOTE: Ehrlic’s reagent tests for the presence of indoles. The color reaction is always purple. LSD is an indole. 25i-NBOMe is not. Scrape a tiny bit of your pill or powder onto a white ceramic plate. Take the reagent bottle out of the plastic safety container. Remove the cap and turn the bottle upside-down a couple inches over the powder. Squeeze one drop out of the bottle onto the powder. Be careful to not let the dropper bottle touch your powder or you will contaminate the kit and ruin the entire bottle. Observe the color change right away. 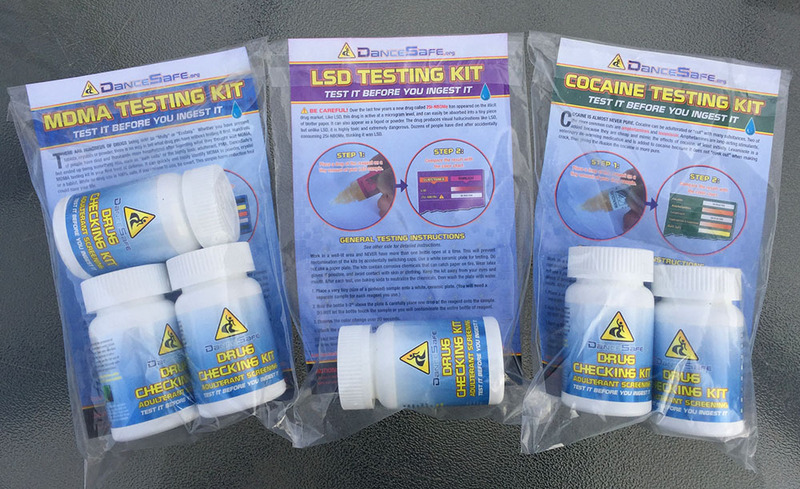 Use the corresponding kits column on the DanceSafe color chart included with your kit to evaluate your test. 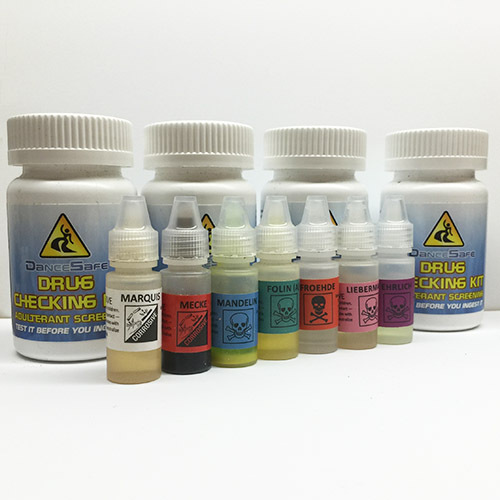 The DanceSafe reagents are primarily sulfuric acid with other potentially dangerous chemicals and are strong enough to burn skin and clothing. Keep out of eyes and mouth. Wear latex gloves when handling the bottle and cap. If you get some on you, then wash quickly with soap and water. Wash testing surfaces with soap and water as well. Dispose of any unwanted reagent down the sink with running water and baking soda. Store all testing kits in a cold, dark place (like your refrigerator) between uses. NOTE: DanceSafe Reagents can only determine the PRESENCE, not QUANTITY or PURITY, of a particular substance. Dark color reactions will tend to override reactions to other substances also in the pill.